Happy Three Clover Thursday! Sorry for the bad picture, I need a new light bulb for my Ott Lite, and haven't had time to look for a source online. For the month of September Kerry has issued all Back To School related challenges, some more challenging than others. This weeks challenge is Back to School using Primary colors. To create my card I used the 3 Step School Days from Kitchen Sink Stamps, stamping the apple Warhol Style. I used Riding Hood Red, Yo Yo Yellow and Garden Green stamping as follows #4, #3, #2, #1. I did find it easiest to stamp the #4 in each color on White card stock using my SAMJ, then working on just one apple panel at a time. The edges of each card are sponged with the same color ink as the apples used. The sentiment was stamped in Black before I ran it through the Big Shot using the CuttleBug Distressed Stripes Folder. Looking for more BTS Inspiration, then click on the Three Clovers Thursday Logo on my sidebar. Appleicious darrrrllling! A very stunning card done in the primary colors. Adorable card, love the colors and layout!!! Excellent work! This is so cute Lisa! Great job! This is great. Love the apple stamped in the different colors. 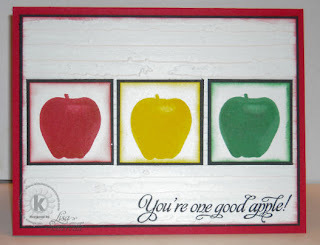 very cute, love the apples done in the primary colors! Love the clean look of this card! Fantastic! Love the vibrant colors of the apples. Great card Lisa! I was trying to remember all the red, green and yellow apples that I love...a memory test LOL!